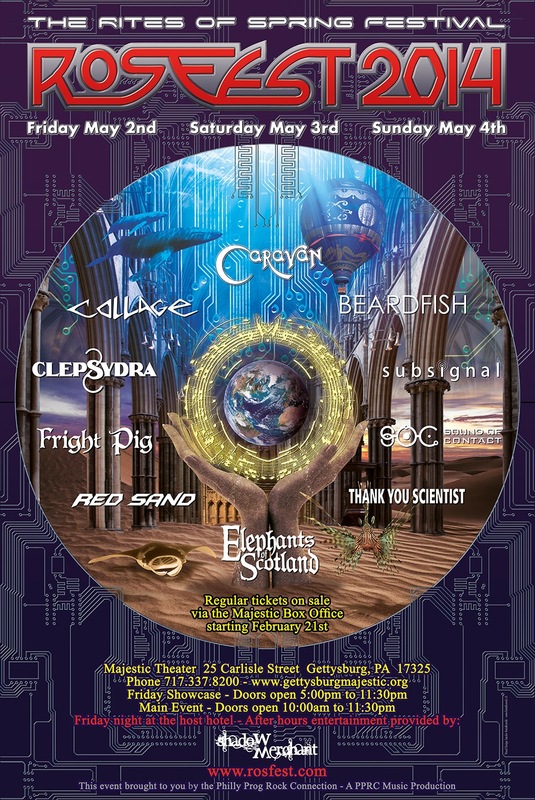 Gettysburg, PA - The most anticipated music festival of 2014, the legendary RoSfest, will take place this year May 2-4, 2014, and will feature progressive rock icons Caravan, Beardfish, Collage, Clepsydra, Sound Of Contact and others! The Rites of Spring Festival, or RoSfest as it's commonly called, is an annual progressive rock festival held every spring in Gettysburg, PA. RoSfest is in its 11th year, and are thrilled to be presenting UK prog icons Caravan, who has not performed in the US in many years, along with 9 other amazing bands this year. RoSfest has always been at the forefront of bringing new and upcoming progressive rock bands to an American audience, while also bringing in bands that were at their peak during the heyday of prog rock in the 70's. This year's lineup features 10 bands over three days, with Friday night's show featuring Clepsydra (Switzerland) and Caravan (UK). Saturday's show features Elephants of Scotland (US), Sound of Contact (UK), Thank You Scientist (US), and Beardfish (Sweden). Sunday's lineup features Fright Pig (US), Red Sand (Canada), Subsignal (Germany), and Collage (Poland). All three days feature a strong lineup with a mix of different sounds and styles within progressive rock. With a history going back to 1968, Caravan is one of a dwindling amount of bands around that merits a description as living legends. They were one of the two principal bands in the Canterbury Scene, a movement that saw bands blending elements from progressive rock and fusion with whimsical lyrics, quirky instrumental movements and a distinct English sound - but often without any major superficial likeness shared between the bands subscribed to this style. Caravan peaked commercially early on, with 1971's 'In the Land of Grey and Pink' their best-selling album. Their early 70's albums in general are all considered classics today, and while they never made much of an impact in the UK or US in these early days their stature have continued to grow following the resurgence of interest in progressive rock. Following spells of inactivity in the 1980's and 90's Caravan have been a mostly going concern since 1995, albeit with a number of line-up alterations along the way. The current incarnation of the band dates back to 2010 and consists of Pye Hastings, Geoffrey Richardson, Jan Schelhaas, Jim Leverton and Mark Walker. Twelve years have gone by since Caravan had their last triumphant return to the US at Nearfest. While Beardfish is still regarded by many as a fairly new band on the scene they have actually been around for more than a decade already, with seven full length albums to their name. Initially renowned for their fairly eclectic take on retro-progressive rock they have developed towards a harder edged variety of that sound in later years, firmly documented on their 2012 album 'The Void'. An album they finished promoting in October 2013. Multinational band Sound of Contact is a new player on the scene, so to speak, but with a potential that secured them a contract with prestigious label InsideOut for their first release. The instigator of this band is one Simon Collins. As a solo artist he has released three full length albums over the past decade, establishing his credentials firmly prior to venturing out into band and progressive rock circles. A vital part of his music resume and presumably more important for him than many others. Simon Collins is a vocalist and drummer both, just like his father Phil was. And Phil Collins is a musician that easily merits a description as famous. With an already established career, Simon has seen to it that he isn't merely regarded as the son of his father when now following in his footsteps. The reception given to Sound of Contact's debut album 'Dimensionaut' in 2013 emphasize that clearly, with a steadily growing number of glowing reviews following in it's wake. Sound of Contact live, for live purposes consisting of Simon Collins (vocals, drums), Bill Jenkins (keyboards, vocals), Matt Dorsey (bass, vocals), Randy McStine (guitars) and Ronen Gordon (drums). Majestic Theater website - http://www.gettysburgmajestic.org/ and click BUY TICKET Tab and scroll down to the show to purchase tickets.